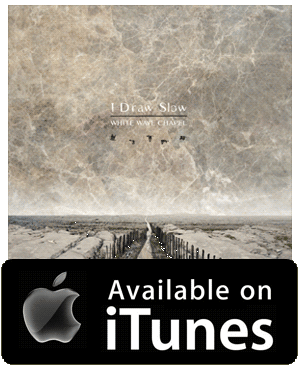 If proof were needed that the world is shrinking, Dublin band I Draw Slow’s third album White Wave Chapel is a transatlantic marriage of contemporary Americana, bluegrass and old-world folk balladry. In the past that may have raised eyebrows and caused breath to sharpen on intake, but the ability to send a song halfway around the world at the touch of a button has blurred the genre lines and barriers until they barely notice against song-writing that sounds both old fashioned and fresh at the same time. Apt, then, that I Draw Slow were invitees to the 2012 Celtic Connections festival, boosting a fast-rising profile and reputation which was solidified by the release of their top 10 selling second album, ‘Redhills’. White Wave Chapel opens to a salvo of fiddle driven tracks All Souls, Don’t She Run and Now You’re Gone which on first listen may appear to have a uniformity about them, an impression that is soon dispelled with repeated listening. The catchy chorus of Don’t She Run and the a cappella finish to Now You’re Gone raise them out of the ordinary. In between, Souvenir is the first sign that you’re listening to something special, a lovely melody allied to a fragile vocal with a lullaby-simplicity reminiscent of Patty Griffin at her most delicate. Souvenir is the hook that sinks you, because White Wave Chapel is that rarest of beasts; an album that gets better the longer it goes on. Each song tops the last, a refreshing change from the albums that offer much, packing in 20 songs where 10 would have done. The Captain is a jaunty roundelay you can imagine joining in with in a pub on the quayside and from there to the finish it’s a finely polished combination of beautiful harmonies and beguiling melody. Grand Hotel has a clever lyric and a rousing chorus, Springtime’s picked guitar is a distant cousin of Welch and Rawlings with Milk Carton Kids harmonies, and Valentine is flat out brilliant, building a story of wronged hearts into a great chorus. The standard of musicianship is excellent. Thankfully, the kitchen sink has remained unused and a core of traditional instruments find more than enough breadth and depth to avoid the need for multiple tracks of esoteric string, reed and percussive apparatus. Guitar (Dave Holden), double bass (Konrad Liddy), banjo (Colin Derham), fiddle (Adrian Hart) and voice (Louise Holden) is all I Draw Slow need. On this album they sound as a band who’s been playing together since 2008 should; tight and relaxed at the same time, none more so on Hide and Seek, with its reference to Mockingbird at the end, and the final track Old Wars which is head and shoulders above the rest of the album in terms of song-writing. A beautiful guitar ballad, it signals an exciting wait for I Draw Slow’s fans – as a taste of things to come, Old Wars shows a maturity and class suggesting this band is really going places. They may draw slow, but their aim is good.